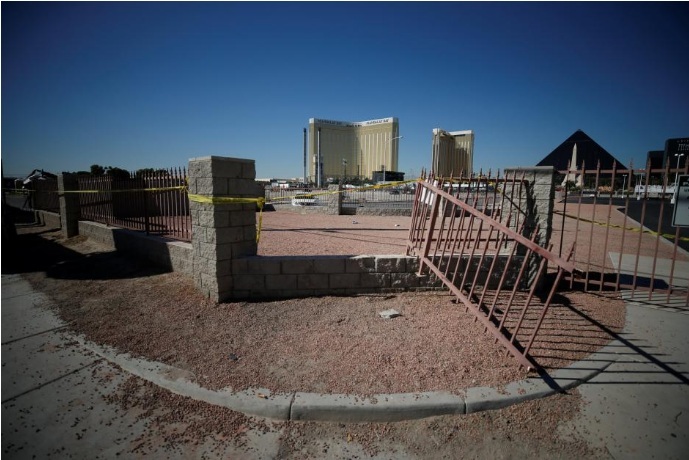 A broken fence is pictured leading from the parking lot near the site of the Route 91 music festival mass shooting in Las Vegas, Nevada, U.S., October 5, 2017. LAS VEGAS - The U.S. gun lobby, which has seldom embraced new firearms-control measures, voiced a readiness on Thursday to restrict a rifle accessory that enabled a Las Vegas gunman to strafe a crowd with bursts of sustained fire as if from an automatic weapon. Police have said the gunman, Stephen Paddock, equipped 12 of his weapons with so-called bump-stock devices that allow semi-automatic rifles to operate as if they were fully automatic machine guns, which are otherwise outlawed in the United States. Authorities said his ability to fire hundreds of rounds per minute over the course of 10 minutes from his perch in a 32nd-floor hotel suite was a major factor in the high casualty count of 58 people killed and hundreds wounded. Paddock, 64, killed himself before police stormed his suite. Senior Republicans also signaled they were ready to deal with the sale of bump stocks - an accessory gun control advocates regard as work-arounds to bans on machine-guns. “Clearly that’s something we need to look into,” House Speaker Paul Ryan told radio talk show host Hugh Hewitt. “I didn’t even know what they were until this week ... I think we’re quickly coming up to speed with what this is,” Ryan said. The No. 2 Republican senator had called for a review of bump stocks a day earlier. Democrats were already urging new legislation, as the shooting reignited the long-standing U.S. debate over regulation of gun ownership, protected under the Second Amendment of the U.S. Constitution. “There are people who want to rush to judgment,” Scalise said in an MSNBC interview on Thursday. The NRA called for the U.S. Bureau of Alcohol, Tobacco, Firearms and Explosives to address bump stocks by regulation, rather than opening up the issue to the legislative process. Thousands of mourners turned out on Thursday evening for a candlelight vigil honoring a Las Vegas police officer and member of the Nevada National Guard who was among those slain at Sunday’s concert while he was there off duty. Under a full moon in a grassy memorial park, a police honor guard including bag pipes paid tribute to Charleston Hartfield, 34, who is survived by his wife and two children. The Las Vegas Review-Journal also reported on Thursday that organizers of a gun show scheduled for this weekend at the Eastside Cannery Casino had canceled the event, saying it did not seem “prudent” in light of Sunday’s tragedy. Investigators remained puzzled at what drove Paddock, a well-off retiree and avid gambler, to assemble an arsenal of nearly 50 firearms, thousands of rounds of ammunition and a supply of explosives before opening fire on a country music festival attended by 20,000 people. Reports emerged on Thursday that Paddock may have targeted other sites for attack in Chicago or Boston before the Las Vegas shooting. A man named Stephen Paddock booked rooms in a Chicago hotel that overlooked the grounds of the Lollapalooza music festival last month, a spokeswoman for Chicago’s Blackstone Hotel said in an e-mail. It was unclear if that person, who never checked in, was the same Stephen Paddock, the spokeswoman said. Police in Boston and Chicago said they were aware of the reports and were investigating them. Clark County Sheriff Joseph Lombardo confirmed on Wednesday that Paddock rented a room at the Ogden, a downtown Las Vegas luxury condominium complex near the site of another music festival, on the weekend before his attack. Lombardo said police were reviewing video to determine what Paddock did there. Discerning Paddock’s motive has proven especially baffling as he had no criminal record, no known history of mental illness and no outward signs of social disaffection, political discontent or extremist ideology, police said. She shared Paddock’s home at a retirement community in Mesquite, Nevada, northeast of Las Vegas, before traveling to the Philippines in mid-September. Investigators questioned her about Paddock’s weapons purchases, a $100,000 wire transfer to a Philippine bank that appeared to be intended for her, and whether she saw any changes in his behavior. The U.S. gun lobby, which has seldom embraced new firearms-control measures, voiced a readiness on Thursday to restrict a rifle accessory that enabled a Las Vegas gunman to strafe a crowd with bursts of sustained fire as if from an automatic weapon.